The flipped classroom is a drastic change for many students, particularly in professional education. The typical professional student was often very successful in a lecture-based environment. To be metabolically efficient, the brain generally tries to predict what will happen next and spends energy only when reality is different than the prediction. Whether physically moving to an active classroom or changing the format in the same classroom, flipping the class session minimizes the brain's predictive power, stimulates the amygdala, and increases brain activity. Thus, the change curve is activated. The brain and its attendant student are set on high alert and have to work to mitigate the stress response. As Tolman et al. suggest, we should consider signs of student resistance a signal rather than an attitude. Students may not be resistant, but rather mentally occupied. The Kubler-Ross change curve is also known as the five stages of grief (denial, anger, bargaining, depression, and acceptance). The curve has since been broadened and modified to reflect typical stages of personal and organizational change., The management change curve typically describes four to seven separate stages, starting with shock and ending with integration [Figure 1], and is used to help explain and predict how people will respond to change. The Kubler-Ross change curve is rarely discussed as a part of the student (or faculty) response to the flipped classroom., However, it is very likely a significant force and addressing it may enhance learning. Eustress is considered good for learning but not all parts of the change curve stay within that zone of good stress and parts can be very detrimental for learning. If left to unfold naturally, the stages vary in length between individuals with most everyone progressing from denial to acceptance over time. In the classroom, however, it is imperative that the process should be shortened as much as possible to allow change (integration) to occur. The business world has developed key guidelines to help people at various stages of the curve adapt and move forward in a timely manner. Furthermore, these guidelines can be directly applied to the classroom. The goal of this article is to (1) show how the change curve reflects student stressors associated with flipped classrooms and (2) suggest steps that should minimize time spent managing student stress while also maximizing time spent on course-related material. The first reaction to significant change typically is shock, followed quickly by denial. People in this phase may not be fully functioning and may need additional reassurance and guidance. Further, performance often drops and learning is impaired., For many students in medical and health professions programs, these feelings often manifest in the form of panic. Students grow convinced that the course will ruin their grade point average, their chance for scholarships, and possibly their future as a health professional. Management steps are available [Table 1]. Frustration typically sets in as soon as panic subsides. Here, students' brains are still trying to adjust to the new normal and working hard to reduce the stress response. Students struggle to learn in this new paradigm as their traditional classroom habits and skills are less effective. Research suggests that frustration is productive for student learning and retention, but students typically will not see that on their own as they are still in denial. Even for students who agree the flipped classroom format is useful, the adjustment and type of learning are often still challenging. If we were to solicit feedback at this stage, we would likely hear statements such as “I'm not paying tuition to teach myself,” “this is too hard,” and “I can't learn this way.” Some students become stuck at this stage, and we only learn of their frustration when we review comments from end-of-course evaluations. Further complicating matters, students know most courses begin by covering fundamental concepts and grow progressively more challenging over time. As students become increasingly familiar with the flipped classroom format and develop the skills necessary for success in this format, the learning experience becomes less stressful. However, many students will assume that an already challenging course is going to become exponentially more difficult and that it may be virtually impossible for them to succeed. [Table 2] shows the management suggestions. 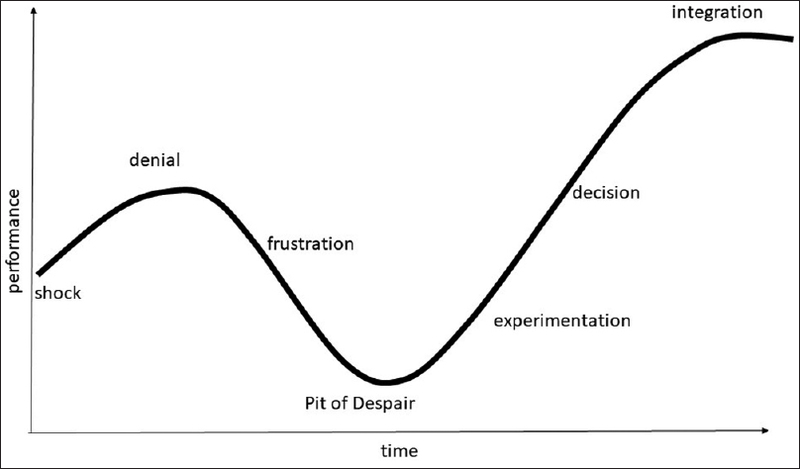 Frustration is followed by depression or the “pit of despair.” At this point, the work is still hard, and students are not yet seeing the light at the end of the tunnel and are no longer stimulated by the environmental change (lower adrenaline release). The material may also be becoming more challenging with time [Table 3]. After depression, things typically start to get better. Students realize that they might actually be learning and they start to experiment and push out of their comfort zones. Eustress now predominates, as does learning [Table 4]. If experimenting goes well, students decide to commit and performance improves, accompanied by a more positive mental outlook. However, do not expect students to make it known that their attitudes have shifted. At this point, it is critical to keep moving forward [Table 5]. The goal of the flipped classroom is generally critical thinking and application of integrated knowledge. It is now happening. With careful attention to the previous stages of the change curve, it may even be occurring before the end of the course. Students are now comfortable with the new format and are learning and retaining more. They have been practicing integration and application and are gaining significant skills in critical analysis. However, it is their new normal and they do not realize that it is extraordinary [Table 6]. 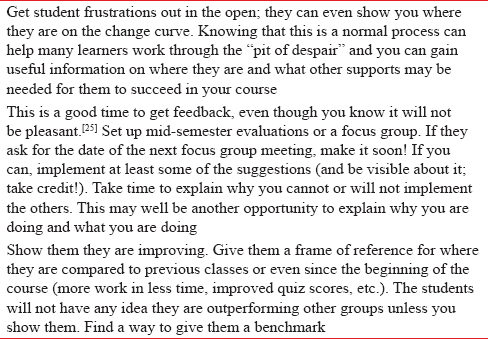 Following at least some of the steps in [Table 1], [Table 2], [Table 3], [Table 4], [Table 5], [Table 6] should help ease students through the change in format with the majority making it beyond the pit of despair into experimentation or even integration. However, a number of additional considerations may also be helpful. Backward design helps focus objectives and align them with examination questions and classroom activities. Instructors will inevitably need to cut some content to flip the classroom. Using backward design can help educators know what content to retain. 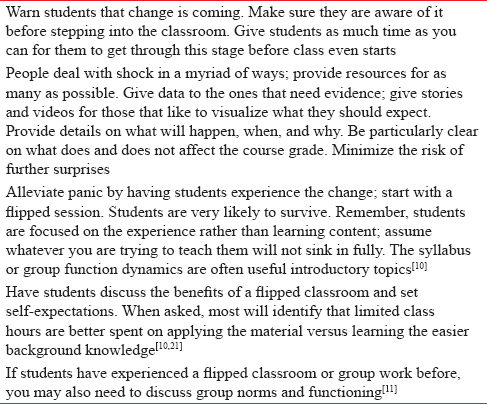 The transition to a flipped class format may be more complex than one might anticipate. It may be helpful to retain other elements of the course with which students are already familiar (e.g., use an existing testing format, etc.) or to use a template for a flipped classroom such as team-based learning. Avoid adding more change if possible. Assessment drives learning. Professional students often study strategically for the anticipated test format. If students should use the literature, work as a group, analyze options, and be able to handle complex cases, the test should emphasize complex cases that require them to use the literature and each other to come to a decision. Moreover, for them to succeed on that examination, they need to practice those skills often. Tests also have significant power. Students will be more likely to retain tested material and more likely to forget untested material. Therefore, it is imperative that critical material is tested. If possible, re-assess students on the content (e.g., cumulative examinations) to increase the likelihood of knowledge/skill retention. Students are not the only ones experiencing the change curve with a flipped classroom. Instructors are experiencing and coping with change as well. Instead of shock, instructors generally start with high expectations; however, change takes time. Creating a highly functioning flipped class scenario often takes 2–3 years; in the interim lies the “pit of despair”. To help instructors through the process, Review the literature, discuss with colleagues, and reinforce the reasons the change was desired and needed. Students benefit from a consistent format to lower their cognitive load. The more instructors that are included, the harder it likely will be to maintain consistency. While there are mechanisms that can help (e.g., a course coordinator that sits in on each lecture, asking each instructor to use a consistent format, etc. ), each additional instructor will tend to add variability that could make the learning experience more difficult for students by way of inconsistent test questions, different approaches, etc. This does not mean other instructors cannot be involved, but consistent formatting can go a long way in helping students become better acclimated to a course. It is important to recognize that many instructors experience a decline in course and instructor evaluation scores after switching to a flipped classroom approach. As noted previously, students often do not take kindly to change, so one would be wise to prepare for some hiccups. It may be advantageous to alert relevant evaluators (e.g., one's department chair, re-appointment and promotion committee, etc.) of any plan to dramatically change a course and obtain his/her/their support. It also would be advantageous to collect feedback early and often. Research has noted that midterm evaluations often result in increased course evaluation scores just by giving students the opportunity to give formative feedback., Of course, formative feedback can also be useful for making course corrections on the fly, particularly in the first few iterations of the course. Finally, students often provide constructive comments. Discussing feedback may provide an opportunity to reiterate why the course has been flipped and what the instructional process is intended to do. As the course ends, make notes on future modifications. Keep the changes small and doable; set specific, measurable, and attainable goals. The process is complex and the desired changes can occur over time. With each iteration, the goal will be to move more and more students to integration; this will be imminently more doable as the standard changes from lecture based to active learning class formats. When finished, celebrate! The changes made, when thoughtfully considered, are likely to result in greater learning and retention. Although the experience may be painful at times, persistence does tend to pay off. Paying attention to the Kubler-Ross change curve and proactively intervening to speed the process may help students more rapidly achieve integration and learn more effectively. Without careful attention, the flipped classroom model may not be able to achieve its full potential. With attention to the change curve, flipped classrooms may become even more powerful for student learning. Freeman S, Eddy SL, McDonough M, Smith MK, Okoroafor N, Jordt H, et al. Active learning increases student performance in science, engineering, and mathematics. Proc Natl Acad Sci U S A 2014;111:8410-5. Baepler P, Walker JD, Driessen M. It's not about seat time: Blending, flipping, and efficiency in active learning classrooms. Comput Educ 2014;78:227-36. Moffett N, Fleisher SC. Matching the neurobiology of learning to teaching principles. J Excell Coll Teach 2013;24:121-51. Lucas KH, Testman JA, Hoyland MN, Kimble AM, Euler ML. Correlation between active-learning coursework and student retention of core content during advanced pharmacy practice experiences. Am J Pharm Educ 2013;77:171. Sultan AS. The flipped classroom: An active teaching and learning strategy for making the sessions more interactive and challenging. J Pak Med Assoc 2018;68:630-2. Chen F, Lui AM, Martinelli SM. A systematic review of the effectiveness of flipped classrooms in medical education. Med Educ 2017;51:585-97. Ramnanan CJ, Pound LD. Advances in medical education and practice: Student perceptions of the flipped classroom. Adv Med Educ Pract 2017;8:63-73. Balan P, Clark M, Restrall G. Preparing students for flipped or team-based learning methods Peter. Educ Train 2015;57:639-57. Yengo-Kahn AM, Baker CE, Lomis AK. Medical students' perspectives on implementing curriculum change at one institution. Acad Med 2017;92:455-61. Silverthorn DU. Teaching and learning in the interactive classroom. Adv Physiol Educ 2006;30:135-40. Finelli CJ, Nguyen K, Demonbrun M, Borrego M, Prince M, Husman J, et al. Reducing student resistance to active learning: Strategies for instructors. Coll Sci Teach 2018;47:80-91. Available from: https://www.search.proquest.com/openview/b0797d406874 6ae3c800d7f446fd5973/1?pq-origsite=gscholar&cbl=49226. [Last accessed on 2018 Nov 24]. Weimer M. Responding to resistiance. In: Learner-Centered Teaching: Five Key Changes to Practice. 1st ed. San Francisco: John Wiley & Sons, Inc.; 2002. p. 149-66. Barrett L. The Predictive Brain. Edge; 2015. Available from: https://www.edge.org/annual-question/2016/response/26707. [Last accessed on 2018 Jan 06]. Tyng CM, Amin HU, Saad MN, Malik AS. The influences of emotion on learning and memory. Front Psychol 2017;8:1454. Tolman AO, Kremling J, Tagg J. Why Students Resist Learning: A Practical Model for Understanding and Helping Students. 1st ed. Sterling: Stylus Publishing, LLC; 2017. Kubler-Ross E. On Death and Dying. New York: Simon & Schuster, Inc.; 1969. The Change Curve. Exeter University; 2012. Available from: https://www.exeter.ac.uk/media/universityofexeter/humanresources/documents/learningdevelopment/the_change_curve.pdf. [Last accessed on 2018 Nov 24]. Anastasia. Understanding the Kubler-Ross Change Curve. Cleverism; 2015. Available from: https://www.cleverism.com/understanding-kubler-ross-change-curve/. [Last accessed on 2018 Nov 24]. Pearson CE, Butler AJ, Murray YP. Understanding veterinary leadership in practice. Vet Rec 2018;182:460. Available from: http://www.veterinaryrecord.bmj.com. [Last accessed on 2018 Nov 24]. Hendrick C. Not All Stress is Bad. The Benefits of Eustress or 'Good Stress' for Learning. Chronotope; 2016. Available from: https://www.chronotopeblog.com/2016/06/03/not-all-stress-is-bad-the-benefits-of-eustress-or-good-stress-for-learning/. [Last accessed on 2018 Jan 06]. Balan P, Thomas L, Dejaeger A, Malone E. Ensuring Student Buy-In and Engagement with TBL or Flipped Classes. In: Getting Student Buy-in to Pre-learning Teaching Methods (Team-Based Learning and Flipped Learning). Chicago, IL: Acadeny of Management; 2018. Kloss RJ. Nudge is best: Helping students through the perry scheme of intellectual development. Coll Teach 1994;42:151-8. Available from: http://www.tandfonline.com/doi/abs/10.1080/87567555.1994.9926847. [Last accessed on 2018 Nov 24]. Malone ED, Kustritz MV, Molgaard LK. Improving response rates for course and instructor evaluations using a global approach. Educ Health Prof 2018;1:7-10. Available from: http://www.ehpjournal.com/temp/EducHealthProf117-2806895_074748.pdf. [Last accessed on 2018 Nov 24]. Balan P, Maritz A, Mckinlay M, Balan P, Maritz A, Mckinlay M. Structured method for innovating in entrepreneurship pedagogies. Educ Train 2017;60:819-40. Available from: https://www.doi.org/10.1108/ET-05-2017-0064. [Last accessed on 2018 Nov 24]. Brickman P, Gormally C, Martella AM. Making the grade: Using instructional feedback and evaluation to inspire evidence-based teaching. CBE Life Sci Educ 2016;15:1-14. 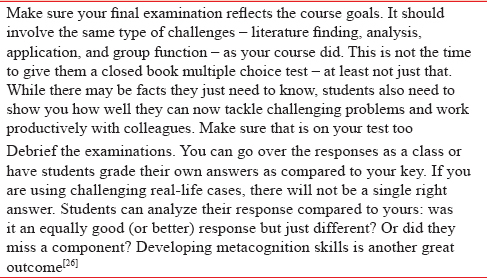 Wismath S, Orr D, Good B. Metacognition: Student reflections on problem solving. Excell Coll Teach 2014;25:69-90. Available from: http://www.search.ebscohost.com/login.aspx?direct=true&db=ehh& AN=98323041&site=eds-live&scope=site. [Last accessed on 2018 Nov 24]. Michaelsen LK, Sweet M. Team-based learning. New Dir Teach Learn 2011;128:41-51. Margolis AR, Porter AL, Pitterle ME. Best practices for use of blended learning. Am J Pharm Educ 2017;81:49. Chigerwe M, Ilkiw JE, Boudreaux KA. Influence of a veterinary curriculum on the approaches and study skills of veterinary medical students. J Vet Med Educ 2011;38:384-94. Roediger HL, Putnam AL, Smith MA. Ten benefits of testing and their applications to educational practice. In: Psychology of Learning and Motivation – Advances in Research and Theory. Vol. 55. Elsevier Inc.; 2011. p. 1-36. Available from: http://www.dx.doi.org/10.1016/B978-0-12-387691-1.00001-6. [Last accessed on 2018 Nov 24]. Royal KD. Why veterinary medical educators should embrace cumulative final exams. J Vet Med Educ 2017;44:346-50. Young JQ, Van Merrienboer J, Durning S, Ten Cate O. Cognitive load theory: Implications for medical education: AMEE guide no. 86. Med Teach 2014;36:371-84. Janssen J, Kirschner F, Erkens G, Kirschner PA, Paas F. Making the black box of collaborative learning transparent: Combining process-oriented and cognitive load approaches. Educ Psychol Rev 2010;22:139-54. Veeck A, O'Reilly K, MacMillan A, Yu H. The use of collaborative midterm student evaluations to provide actionable results. J Mark Educ 2016;38:157-69. Cohen PA. Student ratings of instruction and student achievement: A meta-analysis of multisection validity studies. Rev Educ Res 1981;51:281-309. Available from: http://www.rer.sagepub.com/cgi/doi/10.3102/00346543051003281. [Last accessed on 2018 Nov 24].